Jack Wilshere to Man City…. Yeah right!! What absolute and utter garbage!! Red Arse talked yesterday about how we get built up only to be let down by the rumours that do the rounds every transfer window. Mostly of course we tend to get ‘excited’ about those we are linked to, occasionally we get just a tad down hearted about those suggested to be on the brink of leaving. Right now, the main talking point is about whether or not our captain will leave, but then yesterday I saw this written on the good old football rumour site. Someone who is obviously trying to have a laugh, suggested that Citeh are going to sign Jack Wilshere, they have assured him of regular football and the lad can’t wait to move. I’m not even going to give this any more thought, its rubbish, utter rubbish!! Maybe Peter Hill-Wood will come out and say ‘He won’t get into their first team’ – well, he’d be right, a team like Citeh who have billions and trillions of money, don’t give players like Wilshere a chance, they will just go out a buy a player who costs millions. He may not even be that good (Lardybayor & Toure) but as far as they seem to be concerned, if they cost a lot, lets buy him!! Do I dare add that the same person suggested that Aaron Ramsey is off there too…..
Ah well, it keeps us chatting doesn’t it and along the way we can have a laugh about it too. I caught a photo of Arsene Wenger after the press in South Africa caught up with him after they got wind of this latest rumour, he obviously decided to share the story with Steve McClaren…. On to other rumours, we’ve all but signed Schwarzer according to some, nearly signed Tim Howard before he went to the Mancs according to others, but apparently he has a bit of a temper and can have the odd outburst so we didn’t bother! 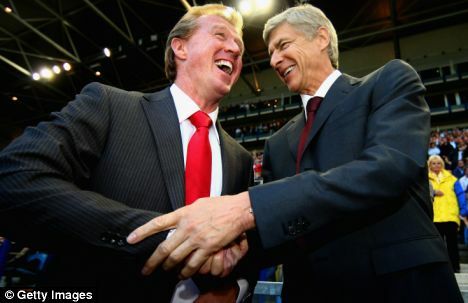 Talking of ‘Arry, he actually mad me chuckle after the Japan/Denmark game – he said he had been in contact with the club of Japanese player Honda. He said the club though wanted to do a player swap deal. ‘Arry though said he wouldn’t swap a Honda for a Bentley…. While talking about our little match tomorrow night, Arsene Wenger has hinted that Sol Campbell may start alongside Thomas Vemaelen in defence if he is fit able to get through ninety minutes, I say ninety minutes as I can’t see this game going into extra time, not the way we score in the dying sconds. Sol playing could be good for us, his experience could be the key factor in keeping the defence focused and on their toes, especially Almunia who I hope has another great display in goal. Just think though if we repeat our ‘late show’ tomorrow night, 0-0 with one minute to go in added time and Nikki pops up with a header – game set and match to us! Right now I would happily take that, I bet most of us would. Song tweaked his groin against Wolves on Saturday, but Wenger has said he should be ok for tomorrow. 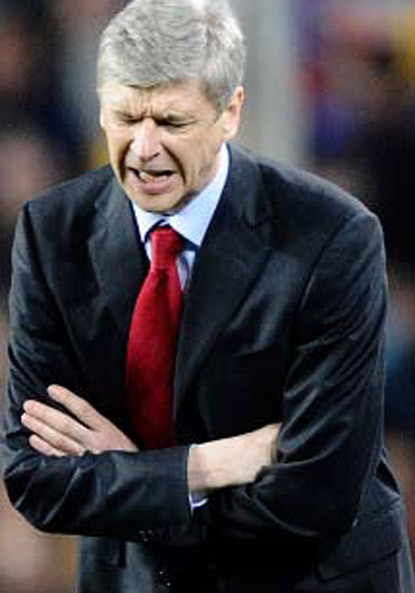 Arsene, I hope he’s more than ‘ok’, if he isn’t fully fit, he can’t start, we need 100% fit players to face Barca, look at what happened to Gallas, we cannot afford something like that to happen to Song. Song has been one of our best players this season and to lose him for the next three or four weeks would be catastrophic! Old favourite Petit has spoken about us, he says that Nasri will fill the hole left by Cesc and with ease, he is one of few who thinks we could go through – good man Manu! “Arsenal have nothing to lose,” Petit told BBC Sport ahead of Tuesday’s game. “If I was Arsene Wenger I’d tell them that they’re on the verge of history. That’s just it, we should play without fear tomorrow, we know we can score against them, we showed that. Barca have their own problems at the back, and that was before Puyol’s red card and further injuries. Barca also have a few injury problems in midfield and up front so hopefully their goal threat will be dented somewhat. Many wanted a new manager at Arsenal, well now you’ve got one! ……. Yesterday, Arsenal Ladies confirmed that they had appointed their new manager, Laura Harvey. The new boss takes up her position after Terry Gervaise stepped down after just eight months in charge – he wanted to give all in his role as Academy Director. Laura, assistant academy director, joined the Arsenal Ladies set-up in the summer of 2008 as first team coach working alongside Gervaise and now General Manager Vic Akers, after which time she also fulfilled the role of Reserve team manager. 29-year-old Harvey is assistant coach for the England U-19s, having previously worked at Under-15 and Under-17 level. On a domestic front Laura’s last club was Birmingham City Ladies, where across a six year period she took on numerous roles including centre of excellence director and first team manager. Laura said: “It’s a really proud moment for me. In women’s football, especially domestically, it doesn’t come any bigger than Arsenal. When you set out to coach and you know this is your dream and your love, you want to make it the best it can possibly be and in my eyes it doesn’t get much bigger than this. I’m looking forward to my new role also the challenge of taking on the responsibility of the team, which starts with our FA Cup Quarter-Final fixture against Doncaster on Sunday”. Some of you may wonder why have posted such news, well, we are Arsenal and the ladies are part of our club..
Good luck to you ladies…. They sit four points off the top of the league with six games in hand – not bad, eh! They are still in the FA Cup and Europe…. Wouldn’t it be just wonderful if the men were in the same position in the Premiership and FA Cup…..
Well we are not, but after the win against the dippers, we are still in with a chance, an outside one, but a chance and now it’s up to us to win all the games and watch others around drop a few here and there. “Unfortunately we have lost Alex Song with a medial knee ligament problem. “I hope he will be available for next week but it is not for sure. Arshavin looks to be a hamstring problem. We have to assess that too. “Nasri got an elbow in his face and he felt unwell. But that is no problem. He will be available. “So the questions marks will be about Arshavin and Song. We’ll know more tomorrow. Arshavin has a scan today and Alex Song has come in for treatment. He is very sore today so we’ll have to see how he responds – that was yesterday so we could find out more today. Let’s hope its good news; surely we have had our quota of injuries for this season. Talking of injuries, how sad is it for Cashley – written off for three months with an ankle fracture! Yes I do have a smirk on my face at the time of writing, much as it pains me to say, he is one of the best left backs in football right now, so lets see how the chavs deal with such a massive blow! Alexandre Dimitri Song Billong, born 9 September 1987 in a Cameroon, fondly known by most as Alex Song. He’s the nephew of Rigobert Song and plays in the heart of a midfield three at our fine club. It is only now though that he is regarded as an important first team player for Arsenal by some, and I am firmly in that category. Alex hasn’t had an easy life, but then who truly has, but he lost his father at just 3yrs old, and from then on his uncle Rigobert became a huge influence on his life, and his love to become a footballer. In 2003/4 Song joined the youth team at Bastia and he must have impressed the management as the following year he played a big part in the first team, making 34 appearances. Many overseas clubs had a scout or two keeping an eye on him, clubs such as Inter Milan, Manchester United, Lyon and Middleborough, but it was our boss who got in there first and took him on loan during the 2005/6 season. Arsene obviously saw something back then. The following season he signed for Arsenal for just £1M. Looking back now, what a bargain! He was only 20yrs old! Until last season, Song has always been a ‘bit part’ the sub that came on and then got ridiculed for his performances. Prior to that, he had loan spell at Charlton. For us he played at CB, CM and generally kept a bit part role when players were injured or just needed a rest. I don’t think many of us honestly believed he would ever become a regular; I used to think he would be a ‘Grimandi’, the squad bod that never really stated a claim in the team. Then suddenly his career seemed to begin to get going, late in 2007 he was named in the 2008 Cameroon side for The African Cup of Nations, and he made his debut against Egypt coming on from the bench, and how good it must have felt for him to be playing alongside his Uncle Rigobert… Cameroon lost the game, but I bet Alex soon got over it! He played in the Cameroon defence during the following games, but got injured in the final, funny enough against Egypt, the team where it all began. Alex had played so well, he was named in the best eleven for the tournament. Maybe it was then that some of us opened our eyes a little bit and started taking him seriously. That same year, 2008, Song was slotted into the midfield for his club, and we all know he was not the choice of the fans. His season didn’t start so well, the slating was cruel, sometimes justified, but often harsh. But as the season went by, he got stronger and stronger and I personally started to worry a lot less when his name was on the team sheet to start. He even nabbed himself a couple of goals against Fenerbachce and Wigan. Added to that he is not a bad CH either, in fact I would trust him more than Senderos or Silvestre, but at the heart of our midfield is where I hope he stays.. This season I think he has started very strong, so much so when I don’t see his name on the team sheet I begin to worry, and on Sunday against Wolverhampton Wanderers proved just why. Until Song came on we were being beaten in midfield. There was little ‘in there’ take control, keep the ball and then let the ball do the work. Diaby proved that right now he is not able to play the role that Song can. Song came on and we began to control the midfield, the game and the result. Song is off soon, and I really worry – really worry. Who on earth is capable of playing alongside Cesc, who is there that will allow our Captain to play with such freedom, most importantly, who will Cesc trust to cover him on his Gump Runs??? Right now, my answer is we have no-one! If Arsenal are to buy only one player in January, surely it has to be a player like Song, doesn’t it? Diaby – well maybe his day will come, he is still very young, Song was very young once, but look at him now. Mr Reliable! Now who would have ever thought that……….